Many users ask for building a Community site like http://community.exoplatform.com. In this site, they want to allow their users to register by themselves, or publish some pages, such as Forum. This tutorial will guide you how to do these tasks via UI. This tutorial has some limitations due to using UI only. 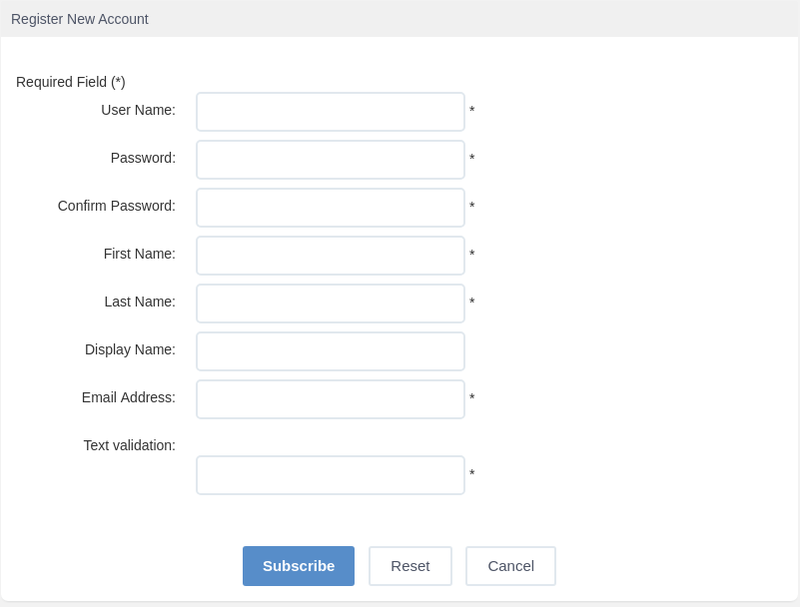 For example, you can allow users to access the Register page, but when a user finishes his registration, he is not automatically redirected to Home page. To go further, you need to do some development tasks. And if you meet any troubles, go to eXo Forum to get some help. When you access intranet site, you are asked to log in, because the access permission of the site is *:/platform/users by default. So, to publish any resource under the "intranet" site, you need to make the site public first. And what happens then? When the site is public, but all the pages are private, then you are still seeing a login form. If there is one public page, the portal will redirect you there without login. 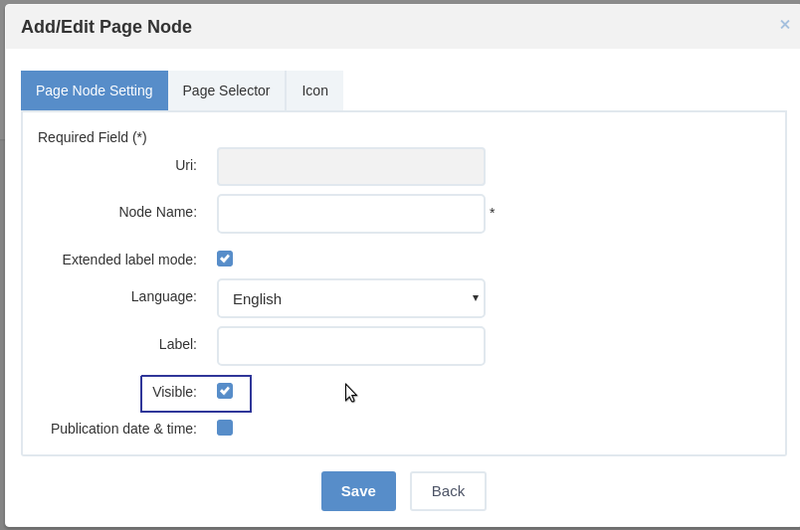 If there are several public pages, the topmost one in the site navigation will be the default redirection. Knowing this, you can allow anonymous users to access some public pages. In the example, you will publish Wiki and Forum, and put a new page called "Welcome" as the default page for anonymous access. The page is not a public one, but the membership *:/platform/guests has access permission, so if the site is public, anonymous users can type the URL /portal/intranet/Register to access this page. You can put a link in the Welcome page so that the user does not have to type the URL. You have read that the topmost page in Site Navigation will be picked up for redirection, when users access /portal/intranet. The Site Navigation can be edited by clicking Edit → Site → Navigation from the top navigation bar. See the screenshot. You can right-click on a page (actually a "node") and choose Move Up (several times) to change the order of the pages. In the example, you publish Welcome, Wiki and Forum pages so you should "Move Up" the Welcome page to the top, but below the Home page. This makes Welcome the default page for anonymous while keeping Home the default page for logged users. You want the Welcome page to offer anonymous users the "Login/Register" links, but logged-in users should not see it. Though they always can access by typing page URL, it is nice to hide Welcome page from the Left Navigator. You can publish the Left Navigator for anonymous access. It is a smart navigator that shows users a page link if and only when the user has access permission to the page, so anonymous only see public pages. The Left Navigator is in fact "some containers and portlets" included in the Site Layout, so you can edit it by clicking Edit → Site → Layout. 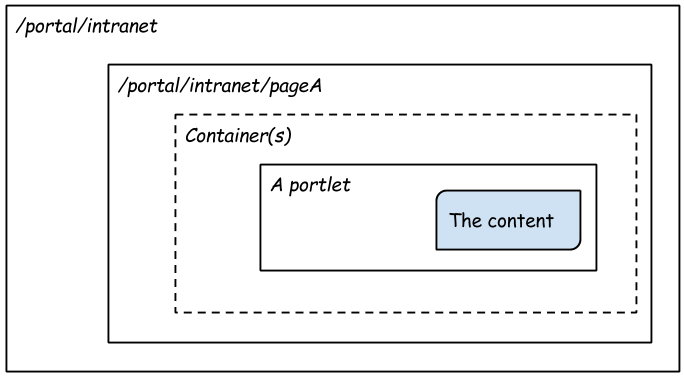 Exactly, you need to publish the portlet UICompanyNavigationPortlet and publish its containers as well. See the illustration. There are three (nested) containers, the outermost one is public by default. The content access also is managed by the relevant application. 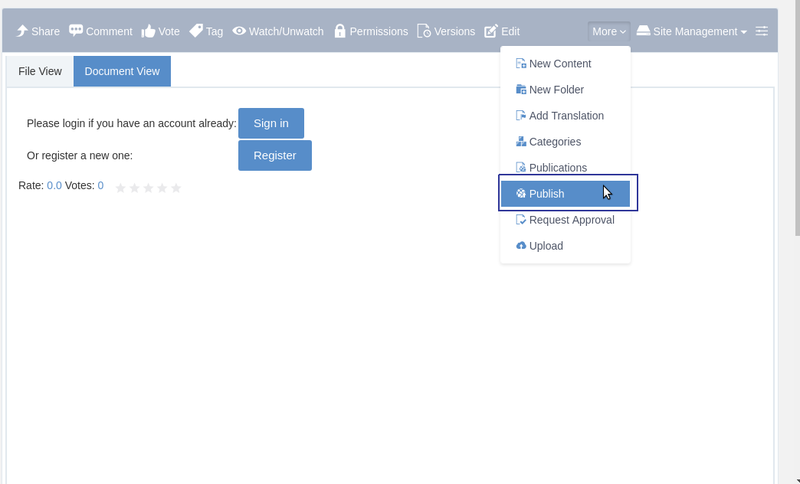 Wiki application allows you to set permission for any individual page. In Forum, the permissions can be set for topic, forum and category. In case of Content, each content has its publication lifecycle. To publish the intranet site, go to either of its page, like Home page, and click Edit → Site → Layout from the top navigation bar, then select Site's Config from the Edit Inline Composer window. In the Permissions → Access, tick the Everyone checkbox. The Everyone checkbox is also available when you edit a page and its portlets and containers. When you are on the page you want to edit, click Edit → Page → Layout from the top navigation bar. 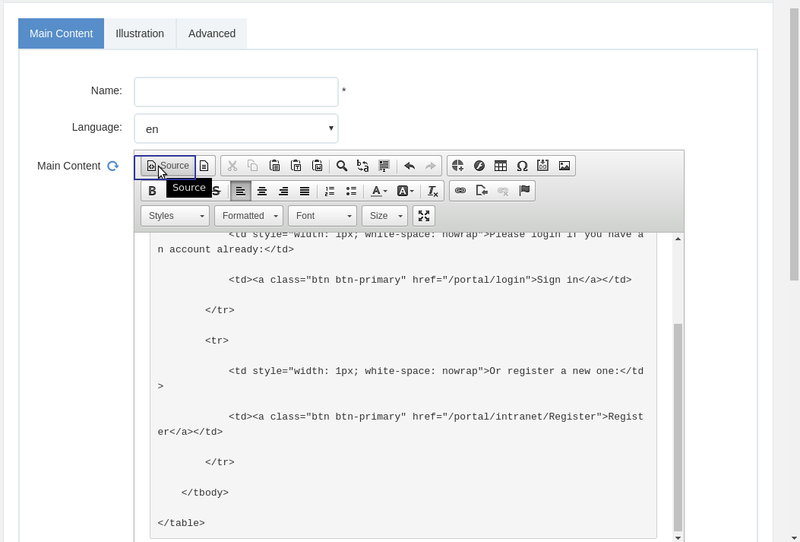 This will open a layout of the portlets and the containers, and a Page Editor floating box. To edit the page access permission: click View Page properties. To edit a portlet's access permission: hover your cursor over the portlet area to see a toolbar. To edit a container's access permission: similar as the portlets, but you need to click the Containers tab in the Page Editor window. In this example, you build a "Welcome" page and make it the default page for anonymous users and give them links to login or register. You also publish the Forum and Wiki page to allow anonymous users to view. You should have administrator privileges. Remember to Save your modification at every step. 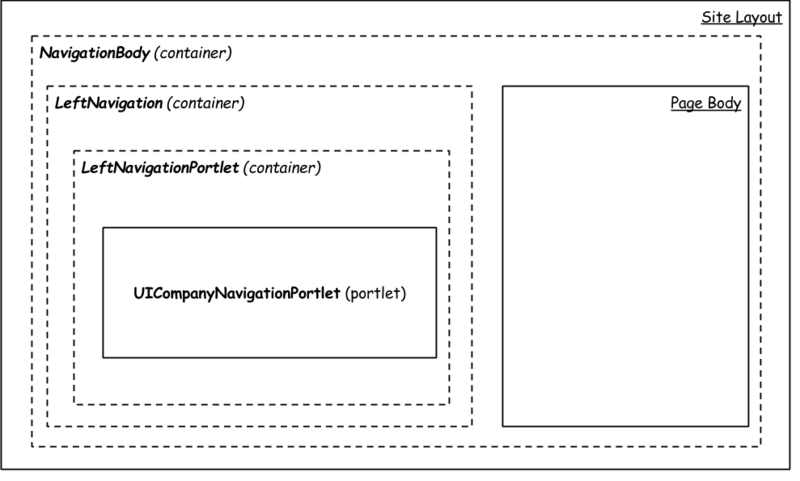 Publish the left navigator, or more exactly the portlet UICompanyNavigationPortlet and its containers. See the above Left Navigator for details. Click Administration → Content → Sites Explorer. 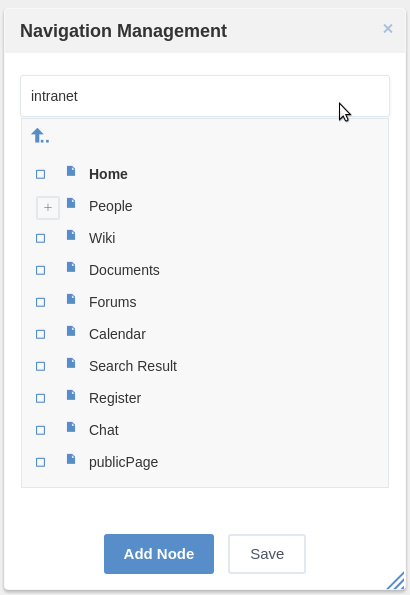 You can create the content somewhere in a general drive, for example Sites Management:/intranet. Save and publish the content. Create a Welcome page. Take care to create the page in the same level with the Home page. Add the Content Detail portlet to the page. Edit the portlet to select the content you created. Publish the portlet and the page. Move up the Welcome page as described in Site Navigation. Also, make the page invisible. Publish Wiki page. As the Wiki Home is restricted by default, publish it as well. The following image shows the screen when an anonymous user accesses /portal.